I’ve been spending a bit of time in my own head lately. Having early morning work hours has encouraged me to observe people and to absorb as much information as I can without being an outward “participant. Yes, I am only an aspiring morning person, not quite there yet. This morning, while standing around in the requisite meeting-circle (it’s like being a kid again, everyone is forced to “hold hands,” but no one really wants to) I looked around and had an epiphany. I use this word lightly, because I’ve had these thoughts germinating in my brain for quite a while. So many people, with their full time jobs and their bills to pay, etc. live their lives entirely unexamined. Once you’ve buried yourself in a world of responsibilities typical of adulthood, it’s very difficult to take a step back and ask yourself if you’re truly happy. This question is not an easy one, and I think it scares a lot of people. You finish school. You get a job. And then you meet someone. And then you get married. And then you have children….and then….and then…. People want to categorize your life in the same way that they have categorized theirs. And, consequently, you’re somehow instantly less threatening to other people, easier to understand, if your life follow’s this model. Too many people get caught up in running the routine of life, the “I should…” and the “I’m supposed to…” instead of doing what they really, really want to do. Remember what you wanted to be when you “grew up?” What the hell happened to that? Was anyone’s answer: “I want to do data entry!” or ” I want to be financial analyst for a corporation that cares more about it’s numbers than people!” I don’t think so. But breaking away from this can be scary. 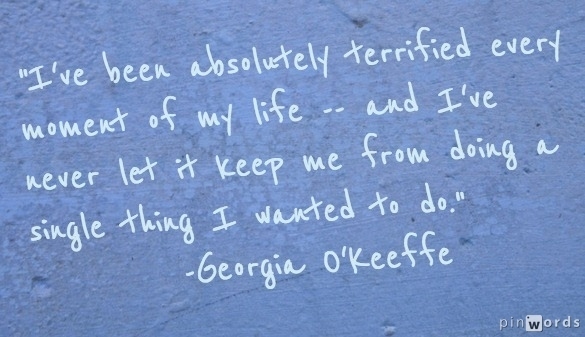 Then again, if life isn’t giving you a good scare every once-in-a-while, what are you doing with it? I don’t want to wait until I’m older to see that there were opportunities I missed because I was too afraid, or because other people thought I should be doing something else. In short, take those chances, accept other people’s support, listen to that inner voice (however small) that’s telling you everything is going to be okay.